Mix flour, sugar and salt. Using a pastry blender cut shortening and butter until the mixture is the consistency of course bread crumbs. Do not over blend. In a small bowl or cup, mix ice water, egg yolk and vinegar. Gradually add water mixture to flour mixture just until the dough clumps together (the dough should be moist but not wet or crumbly). 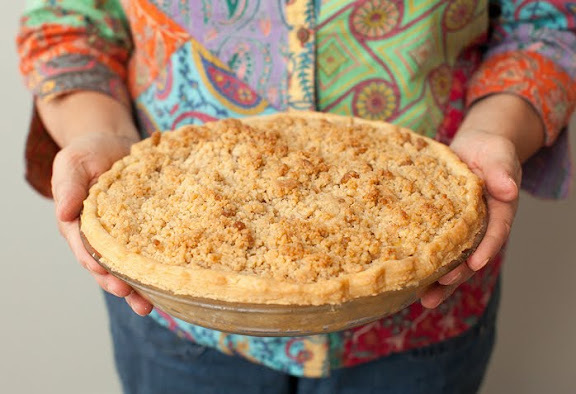 Gather up the dough into a disk and wrap in wax paper and refrigerate while preparing the apples and crumb topping. Roll out dough until it is approximately 13 inches in diameter and 1/8 inch thick. Carefully fold the dough into quarters and transfer to pie dish and flute edges. Mix ingredients in large bowl and pour into prepared pie crust. *Amounts vary depending on the type of apple you are using for your pie. Use more sugar if your apples are especially tart, or more flour if they are really juicy. Cut butter into sugar and flour with a pastry cutter (or in a food processor) until well blended. Spread topping evenly over apple filling. Bake assembled pie at 375 degrees for 40 - 50 minutes. Enjoy! p.s. a special thank you to my mother-in-law for helping me make, photograph, and eat my french apple pie today! Labels: be my guest. dessert anyone? yum that looks so amazing..although is it bad I am picturing it with a drizzle of caramel sauce? I must make this soon, thank you for sharing! Mmm...I was just imagine how wonderful this lovely pie smells fresh out of the oven, delicious! This is a recipe I'll definitely try. There's a bunch of apples around here in New England and I'm always looking for recipes. Thanks for sharing.